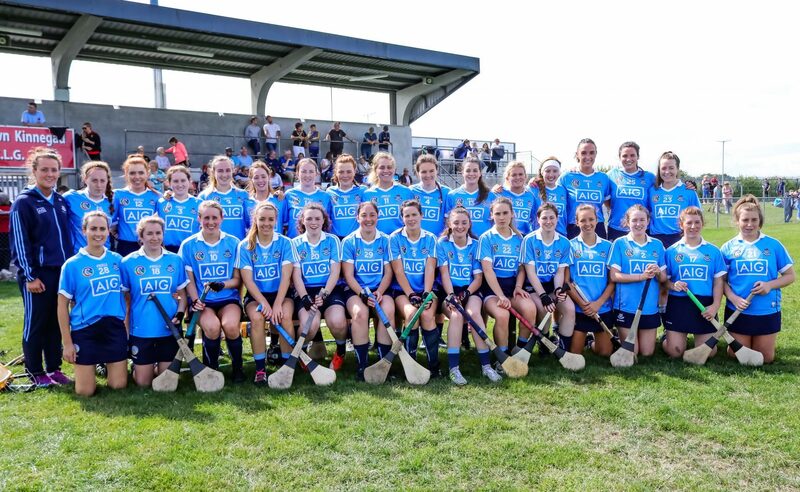 The Dublin Premier Juniors powered their way past Offaly this afternoon to secure their place in September’s All Ireland Final in Croke Park. Dublin dominated the majority of today’s game. It was fairly even between the sides in the opening minutes, but Shane Plowman’s charged soon asserted their authority on the contest. By halftime Dublin led by six points, it could have been an even bigger margin if the girls in blue had taken a couple of guilt edged goal chances they created. They certainly tweaked their radars in the second half raising three green flags on their way to a 15 point winning margin. Offaly drew first blood in the opening minute of the game with a converted free from Aoife Walsh. The sides were level in the fifth minute as dead-ball specialists Aoibhe Dillon swung over her first of the day. Walsh and Dillion swapped frees, but Dublin’s running game and superior passing began to cut holes through the Offaly defence. A nice point from Caragh Dawson in the 7th minute Gabe Dublin the lead for the first time, a lead they wouldn’t relinquish for the remainder of the game. Another excellent effort from the impressive Aoife Bugler stretches the sky blues lead to two. A noteworthy incident in the 16th minute had repercussions for Offaly later in the game. Offaly centre back Brooke Whelehan was yellow carded for a poor tackle which resulted in a penalty for Dublin. Up stepped Aoibhe Dillon but unfortunately her well struck shot just whistled inches past the wrong side of the post. But Dublin were now completely on top and dominating the halfback, midfield and half forward lines. They relentlessly drove at the Offaly defence which was starting to creak under the intense pressure. Points from Aoife Walsh and Aoibhe Dillion pushed Dublin further ahead. They almost put the game to bed before the break but spurned a number of goal chances they carved out and Offaly were still just about hanging onto their coattails. With six minutes to go to the short whistle the Dublin lead was stretched to five thanks to another excellent point from Aoibhe Dillon. 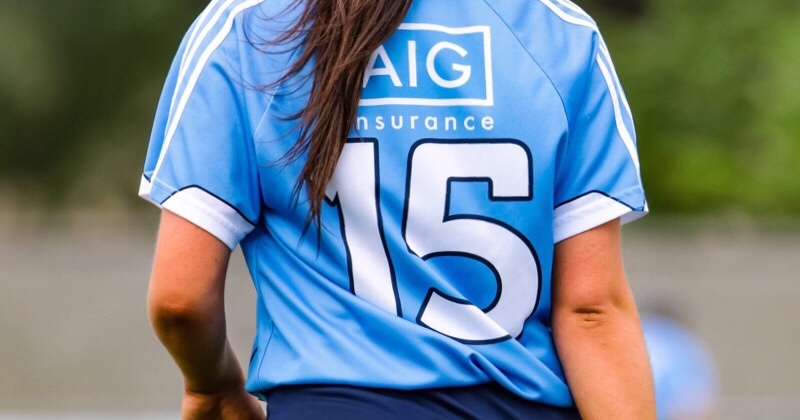 And in injury time Aoife Bugler put six between the teams and Dublin headed to the Coralstown dressing rooms leading 0-08 to 0-02. Offaly needed to grab a couple of early scores after the break to get back into the game. 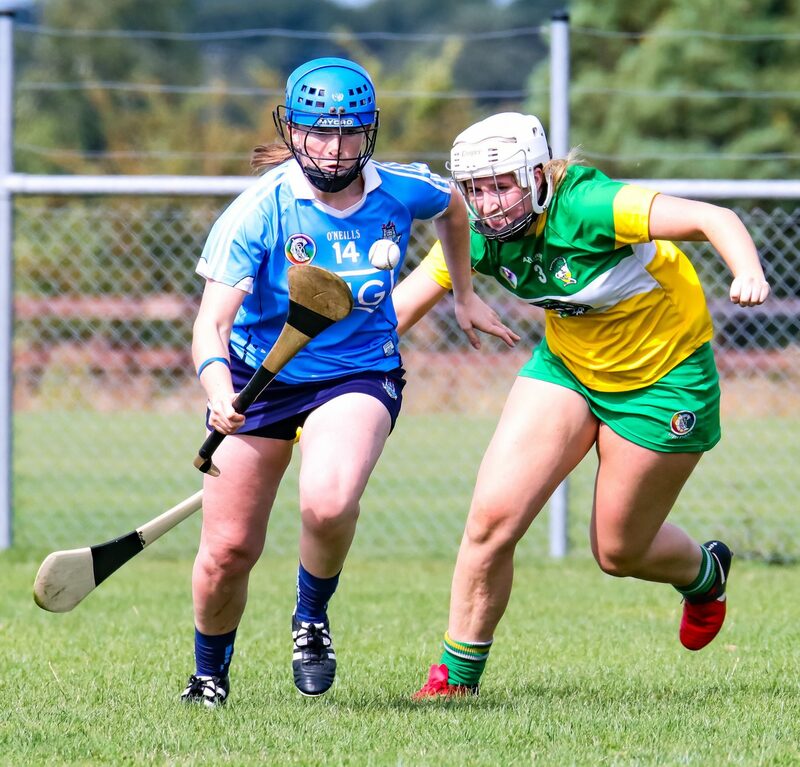 But Dublin were in no mood to accommodate them and two minutes into the second half Aoife Dillion smashed the ball to the net for the games first goal. When Aoife Bugler swung over another fine point two minutes later Dublin looked like they were going to disappear over the horizon. But in all fairness to Offaly they kept the heads up and gave it a real go. They enjoyed a five minute period of sustained possession and ran at Dublin. It payed off with Mary Teehan finding the net with a great finish. That goal gave them a lift and they put the Dublin defence under a small bit of pressure. But two bad wides from frees in score-able positions stopped a potential comeback in its tracks. It got worse for Offaly in the 45th minute when centre back Brooke Whelehan received a second yellow card and subsequent red. Aoibhe Dillion converted the resultant free. Dublin went up through the gears and with the smell of September’s All Ireland Final in Croke Park in their nostrils they drove for home. With eight minutes left in the game the all action Caragh Dawson hit an excellent point. 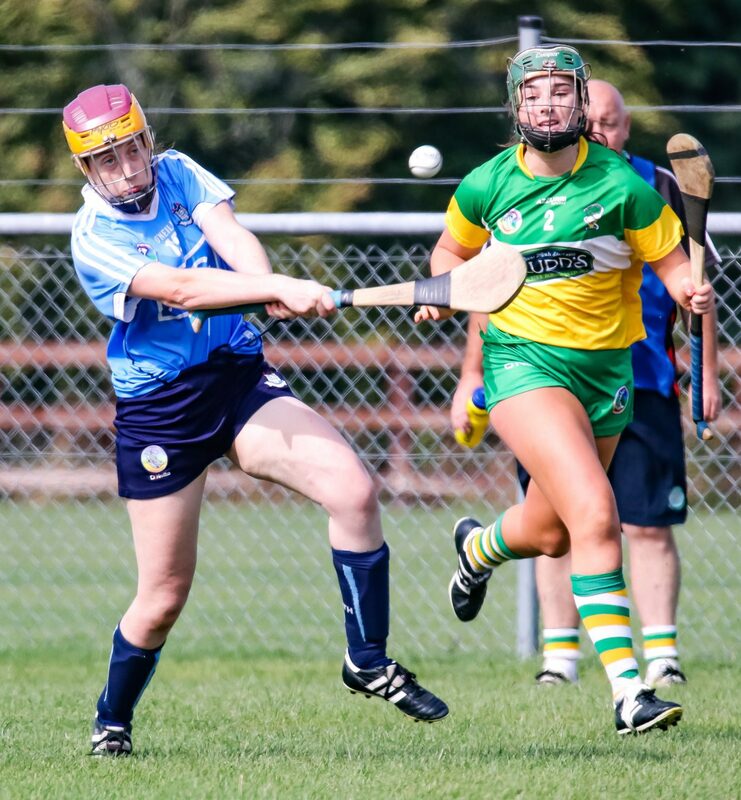 Two minutes later Offaly’s Aoife Walsh reduced the deficit to eight, but that was to be the last score of the game for the girls from the Faithful County. In the 56th minute Dublin’s Aoife Bulgar put the game to bed as she grabbed the girls in blue’s second goal of the game. 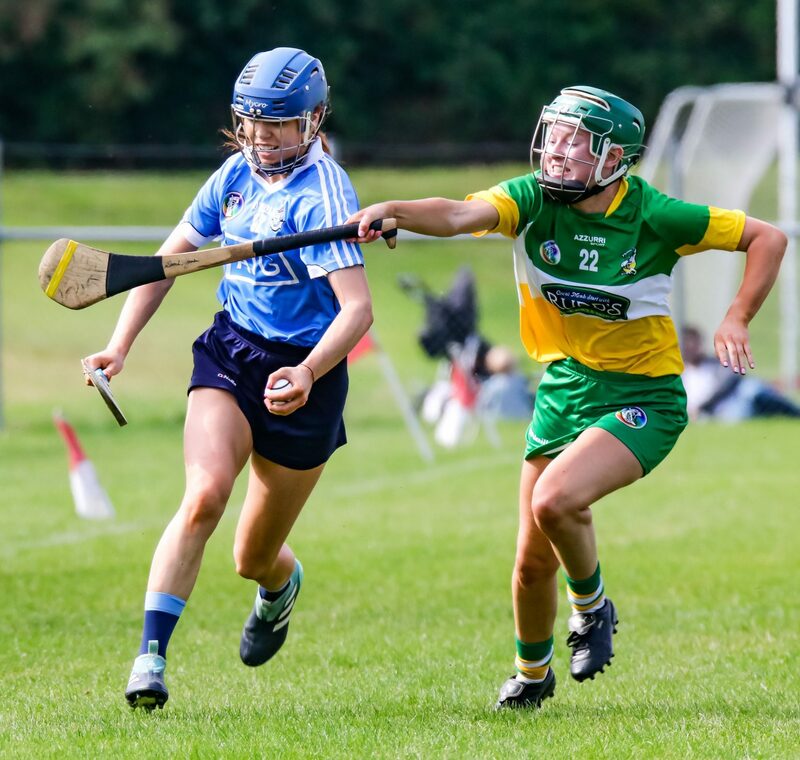 A fine point from Nadine Murphy in the final minute was followed just sixty seconds later by Dublin’s third green flag of the game finished brilliantly to the net by Laoise Quinn. Nadine Murphy almost added a fourth in the dying seconds but it was saved for a 45’. The final whistle sounded before the 45’ could be taken, but it mattered not and the Dublin players and management celebrated a well deserved victory. Dublin now look forward to the All Ireland Final in Croke Park on September the 9th. This is the second year in a row that the Premier Juniors have reached blue ribboned final and the feeling from the group is they left one behind them last year. They will be determined to make go that one step further in three weeks time. Standing in their way will be Kerry who beat Roscommon in the other semi final this afternoon. It should be a cracker. On the 9th of September the Premier All Ireland Final in Croke Park will form part of a triple header which will include the intermediate and senior finals.